The moment we've all been waiting for is finally here! Little True Thompson is on her way and her early arrival has Khloe Kardashian's family rushing to Cleveland to be by KoKo's side on tonight's all-new Keeping Up With the Kardashians. "I'm really praying that we make it there in time. Khloe is in active labor so we're cutting it really close," big sister Kourtney Kardashian revealed to the camera. After touching down in Ohio, the family rushed to the hospital with Khloe's doctor in tow where they were greeted by Tristan Thompson and a few of his close friends. 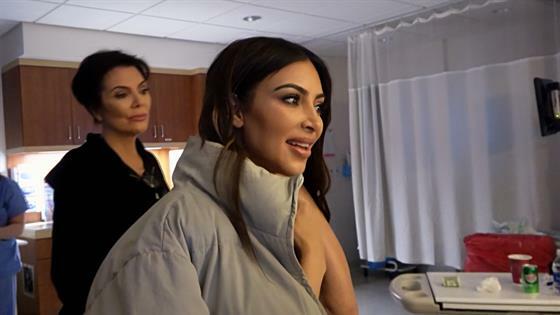 "I am so relieved that we made it and that we'll be able to help Khloe through this delivery like, thank God," Kim Kardashian gushed. But the family's arrival didn't come without any tension. In an attempt to stay positive, Tristan and Kim exchanged a hug, but not before the KKW Beauty boss playfully threatened to cut the Cleveland Cavaliers player. "Are you going to say hi to each other or no?" the pregnant KUWTK star asked both Kim and Tristan. "The vibe in the room is calm, I thought there would be way more tension," Kim noted. "As much as I want to go off, I just don't think it's the time. So I'm gonna keep it cute, I don't have to have a lot of interaction, I just have to be there for her." 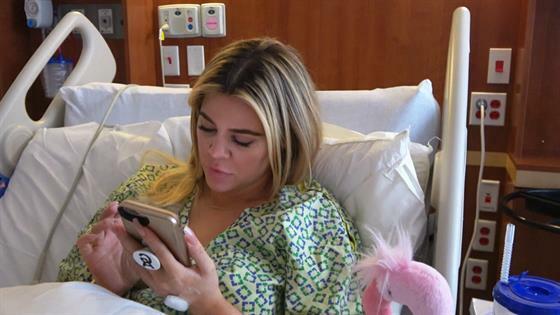 And the rest of Kardashian-Jenners agreed, as they tried to keep the hospital room a positive environment as KoKo inched closer and closer to giving birth. After getting both Kylie Jenner and model Kendall Jenner on FaceTime to join in on the special moment, glam-ma Kris Jenner joined Tristan in helping Khloe breathe and push. "It's just so overwhelming," Khloe confessed. "You're experiencing a miracle take place and I've always dreamed of being a mom, and I think I came to the place where I didn't know if that was actually gonna happen for me and so the fact that we're actually in a delivery room for myself this time, for me to give birth, it's just unreal and I feel so blessed. This is something that I've waited for forever." It didn't take long before baby True was in Khloe's arms, and the new mom was ready to spend the rest of her life with her baby girl. "The minute I met my daughter, I cannot believe I'm even saying the words my daughter," Khloe gushed to the camera. "I was so in love with her and she's just perfect." While all the focus was on Khloe, True and Tristan bonding for the first time as a family, the new mom couldn't fully escape the drama looming from the aftermath of Tristan's cheating scandal. "Is everyone writing you?" Kourtney asked. "Too many people, but writing about both things. I'm like, 'Shut up.'" Khloe vented. "I don't have the energy for that right now like, everyone, leave me alone." The eldest Kardashian sister assured True's mom that everyone just wanted to make sure she knew that she was supported, but for Khloe, it was all a little too much. "It's also, everyone has their own s--t that I know nothing about," Khloe explained. "And mine is thrown on the public of everything and it's just, it's a lot harder to filter through stuff when it's this public and when I gave birth the following day. It's just too much." After getting back into her normal routine, Khloe started to settle into her new role as a mother. "Being home from the hospital has been great. I feel a lot better now that I'm home. I like my own space. I love my routine and I feel good," Khloe admitted. "I'm so in love with True and your obsession becomes more and more and more every single day. And when you think you're at this capacity of love, you're really not. I don't know how, but it just keeps growing and growing and growing." After things calmed down, most of Khloe's family returned to Cleveland to have an off-camera talk with Tristan about his intentions after he stepped out on Khloe. "I think the convo was going OK at the beginning and then it got heated, and I don't know, it just kinda took a left turn," Kim explained to the camera. "Then he got mad because my mom was like, 'You can make your decision. If you want to live this life of dating these Instagram whores and doing your thing, live that life,'" Kim explained to cousin Cici Bussey. "Mom's like, 'If this doesn't work out with you guys, we're always going to rise up.'" While it was a difficult conversation to have, it was a necessary one. Tristan's apology still couldn't take away how heartbreaking the situation was, for the whole family. "She said something really interesting, she said, 'I didn't have a baby just to have a baby and move on.' She said 'I had a baby to create a beautiful family' and that's what broke my heart," Kris lamented. "She really never saw it coming either." 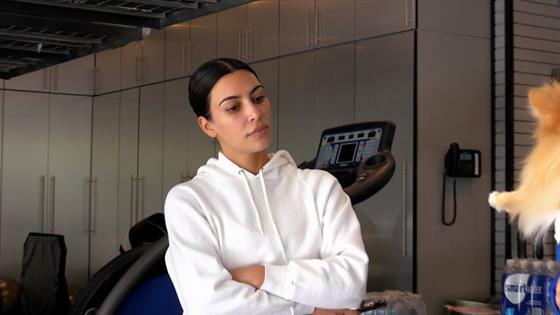 And while Kim vowed to always support her sister, she couldn't help but be "done" with the basketball player. See Khloe's emotional birth and more in the recap video above!